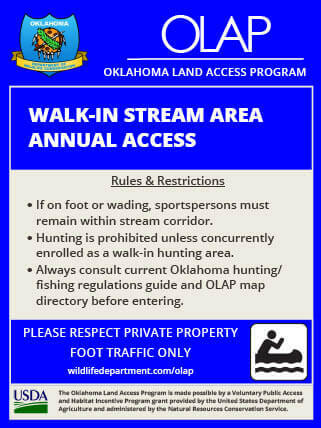 The Oklahoma Land Access Program (OLAP) enrolls private lands to allow public access for hunting, fishing, stream access and/or wildlife viewing. Accessing by foot, sportspersons can enter and use OLAP lands without obtaining special permission or paying a separate fee. The goal of the OLAP is to increase hunting, fishing and recreational opportunities in areas with limited public access. Attention: All sportspersons using OLAP lands are responsible to know and understand the rules of the program, as well as the rules of each property. In addition to program rules, state and federal regulations apply. 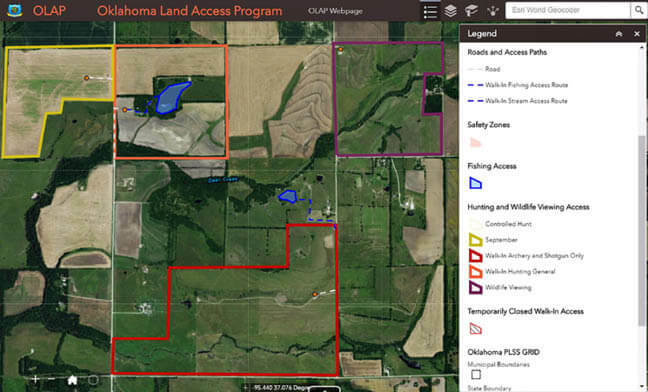 OLAP lands are considered Department-managed lands and all statewide regulations and license requirements apply. The Oklahoma Land Access Program is made possible by a Voluntary Public Access and Habitat Incentive Program grant provided by the United States Department of Agriculture and administered by the Natural Resources Conservation Service. Always think safety first and shooting game second. Respect the landowner. The future of the program depends on the participation of landowners. Pack it in, pack it out. If you see someone else’s trash, please pick it up. Remember to pick up your shotgun hulls. Don’t shoot over property boundaries. Use access points, gates, or corners when available. Don’t stretch fence while crossing. Respect fellow sportspersons and maintain a safe and appropriate distance. Fishing is restricted to no more than three (3) rods or poles per person, with no more than three (3) hooks per line. No other fishing methods are allowed. Cast netting is prohibited. Swimming is prohibited on walk-in fishing areas (annual and seasonal access) only, not stream access areas. Allowed on annual walk-in fishing areas year-round. Allowed on seasonal walk-in fishing areas May 7 – Aug. 31 only. Access is restricted to fishing areas and access corridors as specified in the OLAP map directory and/or on signs posted at the OLAP walk-in area. Unauthorized access to restricted areas of the property may be considered trespassing. Prohibited. Motorized boats are defined as any gas powered vessel. Battery operated vessels are allowed. Allowed. Must be carried to waters edge without the aid of a motorized vehicle. Stream access areas means stream corridors enrolled in the OLAP. Stream corridor means a length of a stream enrolled in the OLAP. These areas may include one or both banks, and the boundaries are delineated by signage and/or the OLAP map directory. Activities unrelated to accessing a stream, fishing, swimming and/or launching/retrieving boats are prohibited. Sportspersons must remain within the designated stream corridor or access area when accessing OLAP stream access areas. Stream corridors will be delineated in OLAP map directory and/or signs posted at OLAP stream access areas. For more information on OLAP properties visit wildlifedepartment.com/olap or download the OLAP app for your mobile device. 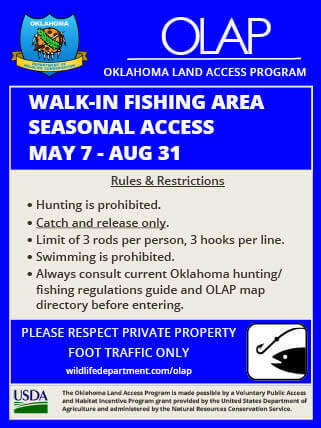 The following are OLAP Walk-in Fishing Area signs. Limit of 3 rods per person, 3 hooks per line. Hunting is prohibited, unless concurrently enrolled as a walk-in hunting area. If on foot or wading, sportspersons must remain within stream corridor or access.